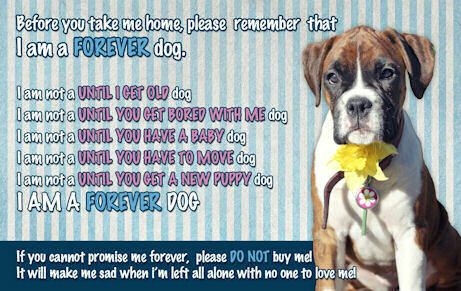 There are many boxers (puppies to seniors) in rescue due to home foreclosures. Please consider a boxer from Boxer Rebound, Ringwood, IL. No More Puppies! We are retired after 50 years of breeding boxers. All pups are placed - updated 5/4/14! This was my last litter I will have in my home! Click here to see ReMax and Floozie puppies were born March 23, 2014! We have 3 males (1 fawns, 2 brindles) and 3 females (2 fawns, 1 brindle). These pups will not get DM. Puppies were due born 3/23/14 and ready to go to homes on May 17, 2014! but I will put pictures here too! ALL PUPS ARE PLACED - (8/23/13)! Click here to see ReMax and Floozie puppies were born July 14, 2013! We have 4 males (2 fawns, 2 brindles) and 4 females (brindles). ALL PUPS ARE PLACED - Kris and Mia's pups were born on 6/2/09. Click HERE to see Kris & Mia puppies. ALL PUPS ARE PLACED - Kris and Abby's pups were born on 12/17/08. Click HERE to see Kris & Abby puppies. Tiny needs a new home - updated 5/30/09. ALL PUPS ARE PLACED - Max and Mia's pups were born on July 15, 2007. Click HERE to see Ch. Max & Mia's puppies. ALL PUPS ARE PLACED - Max and Fiona's pups were born on May 29, 2007. Click HERE to see Ch. Max & Fiona's puppies. ALL PUPS ARE PLACED - Max & Chloe's pups were born on December 9, 2006. Click HERE to see Max & Chloe's puppies. ALL PUPS ARE PLACED - Boston Terriers pups were born January 13, 2007. Click HERE to see Slick & Lexi's puppies. ALL PUPS ARE PLACED - Click HERE to see Libby & Ringo's puppies. ALL PUPS ARE PLACED - Ch. Max & Fiona pups were born on August 29, 2006! ALL PUPS ARE PLACED - Boston Terriers born on July 19, 2006! Click HERE to see the Litter: Ch. Doc's Slick Bavarian (Slick) and Midge pups! ALL PUPS ARE PLACED - Click HERE to see Litter: Ch. Bavaria's B&B Best Spirit "Brea" bred to Ch. Crysto's Image of Arriba had 4 pups on May 20, 2006. ALL PUPS ARE PLACED - Click HERE to see Litter: Ch. Bavaria's B&B Best Spirit "Brea" has been bred to Ch. Bravo's Dance Master. Pups were born on June 10, 2005. ALL PUPS ARE PLACED - Click HERE to see Ch. Bavaria's Simply The Best "Max" & "Roxy's" pups born on Mother's Day, May 8, 2005. We are excited about this breeding to Roxy, a Japanese Import with Aracrest, Turo and High Tech behind her! Please watch this website for updates. There are 3 males (2 flashy fawn and 1 classic fawn) and 4 females (1 flashy fawn, 1 classic fawn, 1 brindle and 1 platinum blonde). ALL PUPS ARE PLACED - Click HERE to see Ch. Max's & Snickers' puppies. - updated 10/25/04. Snickers has double Ch. Araby's Blackwatch behind her. This is a repeat breeding of Bavaria's B&B Best Spirit "Brea" and Bavaria's Undaunted Blaze "Blaze". (born 7/29/04) - updated 9/11/04. (born 4/10/04) - updated 9/11/04. ALL PUPS ARE PLACED - Asia's litter - Born December 23, 2003! Click HERE to see Asia's puppies. - updated 3/11/04. ALL PUPS ARE COMMITTED - Ch. Torrie's litter - Born September 22, 2003! Click HERE to see Torrie's puppies. ALL PUPS ARE COMMITTED - A Litter was born on October 23, 2002! This litter is sired by my Ch. Interlude's Bavarian Hummel (Jack) and is out of Ch. Jubri's String of Pearls (Pearl). ALL PUPS HAVE BEEN PLACED IN SHOW HOMES. Click HERE to see Jack & Pearl's puppies. ALL PUPS HAVE BEEN PLACED IN HOMES - Born June 3, 2002! Pups will be ready to go to homes July 29, 2002. There are 2 males and 2 females. All pups are brindles. Click HERE to see Ditto's puppies. ALL PUPS HAVE BEEN PLACED IN HOMES - Born Jan. 26th! Max was bred to Snickers, a plain brindle double Araby Blackwatch granddaughter. Pups will be ready to go to homes March 23, 2002. There are 4 males (2 plain fawn, 1 flashy brindle and 1 plain brindle) and 3 females (2 flashy brindle and 1 plain brindle). Please email me for an interview. Click HERE to see Max's puppies. ALL PUPS HAVE BEEN PLACED IN HOMES - Updated 3/6/02! Tiffany and Jack's pups were born December 6th. They produced a beautiful litter. Please watch this website for updates. Jack & Tiffany have been ECG'd excellent and Color Doppler'd normal. Please send an email to me at Veraboxers@aol.com to schedule an interview. Click HERE to see Jack & Tiffany puppies. - Updated 3/6/02! ALL PUPS HAVE BEEN PLACED IN HOMES - Updated 3/6/02! Roxie & Jack's puppies - born May 28th, 2001. They produced a beautiful litter last year with Max finishing his championship at 12.5 mos. and Ditto at 18 mos! Please watch this website for updates. Jack & Roxie have been ECG'd excellent and Color Doppler'd normal. Please send an email to me at Veraboxers@aol.com to be added to the waiting list. Click HERE to see Jack & Roxie's puppies. Our previous litter of puppies whelped on September, 11th, 2000. There are 7 flashy puppies. Jack & Tiffany have been ECG'd excellent and Color Doppler'd normal. Click HERE to see Jack & Tiffany puppies. - I lost this page in a PC crash and finally found it today! Updated 3/9/10! puppies sired by Interlude's Bavarian Hummel , "Jack". Click HERE to see the puppies. whelped on July 3, 2000, puppies sired by Interlude's Bavarian Hummel , "Jack".